A 3D model of Falun is slowly growing. At the same time as aerial photos are being mapped, the information is transmitted directly to Topocad via the link to EspaCity. It simplifies the work for survey engineer Andreas Westman and his colleagues. Falun is the city that grows most in Dalarna, a central part of Sweden. In the municipality, a city model has been developed in 3D, and it changes as a result of developments. This year it has been three years since 3D was introduced. Andreas Westman is a survey engineer at the Survey and Map department in the municipal’s construction administration and tells us about the benefits of the technology. – With 3D, we can visualize how a detailed development plan can look like, unlike a regular plan with just polylines and data which can be difficult to understand for a citizen. The urban model consists of a large number of building models that are partially mapped as solids and are exported from Topocad. Given the large number of buildings, they have decided to concentrate on only the newly built buildings to start with. e base map, says Andreas. In order for solids to get the exact dimension, buildings are surveyed. Dimensions must be correct as they show how different buildings are related to each other in the reality. The model will be a basis for assessing and drawing conclusions on, for example, design. The work progress starts in the field where they take pictures of the area with drones or use photos from the Swedish National Land Survey. 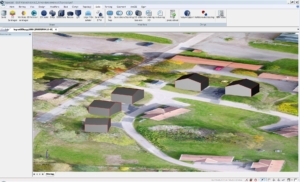 The images are then processed in EspaCity, which is a software for mapping from aerial photography. – We look at the pictures with stereo glasses and do the mapping in EspaCity where we draw polylines and areas. The information is simultaneously passed over to Topocad. – As I do the mapping in EspaCity, the information is read directly into Topocad via a synchronized link. Then I continue in Topocad and can easily create solids using the tools available in the software. Thanks to this connection, data flows from the field via EspaCity to finally become solids. 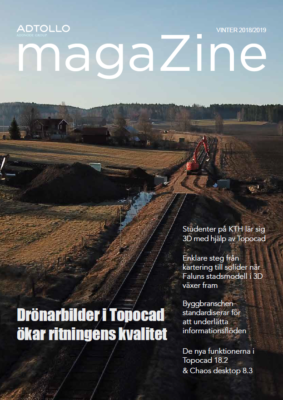 – Topocad serves as a center where all data is linked together, says Andreas. This is where we edit our base map, we build the 3D models and handle all survey data that comes in, ie traditional survey data, from field models, from point clouds, and from EspaCity. One task was to choose the detail level of the city model that corresponds to the need. Falun have chosen Level of Details (LOD) 2. In certain projects, it can be the designers wish that determines the LOD. – LOD 2 is enough to be able to analyze and is a good base for the detail development plan, Andreas says. The level has good visibility; roof racks and full heights are visible on buildings, unlike LOD 1 which are just cubes which is insufficient. LOD 3 requires too much work effort. The city model is updated and saved in a database that has a structure for construction and maintaining the model. The actual update occurs when new information is added, and not only to existing buildings but also when new building are being built in the growing urban environment. Andreas gives an insight of the workflow: At first, the stake out is reviewed based on building permit documents. This is made in Topocad. After that, Andreas and his colleagues implement an area check; the ground is surveyed and inserted into the base map. – This is how we know it will be a 3D building here and we keep an eye on this. In the next step, we follow the construction of the building and when it’s ready we fly with drones and gather information that becomes solids in the urban model. The city model is available to administrations and professionals who have certain needs within surveying and similar assignments. For this a viewer software is used to study the model in detail. The 3D model is complemented by the internal web map containing the base map and the orto map. 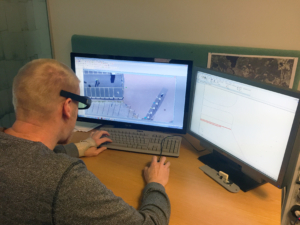 The staff at Falu municipality can use GIS information in several ways and distribute it internally or externally. – Topocad is an open software with several possibilities for exporting data, such as a project. Andreas looks forward to the next version of Topocad. With new calculation features, he hopes it will be even easier to create solids. Working more efficiently is a goal when the urban model is continually filled up with more data and for each day becomes increasingly complex and extensive.